It's Game Over, Flappy Bird players. The madness has ended. 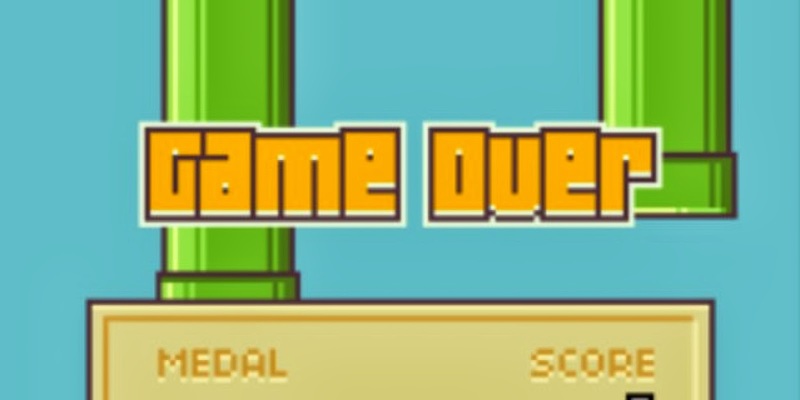 Another frustrating fad of a tiny pixelated bird has swept smartphone users, bringing you just a tap near death, bursting with anger and violent screaming, until it consumes your life and you realize your high score is still only nine points. But all that has finally ended after its developer removed it from the mobile markets. Flappy Bird's creator, Dong Nguyen, announced the news yesterday, saying that he "cannot take this anymore." He followed with another tweet to clarify that "It is not anything related to legal issues. I just cannot keep it anymore." The mobile phenomenon fueled many criticisms over the idea being lifted from similar games such as the Helicopter Game, saying that its unoriginal content goes beyond "inspiration." The background art and sound effects are almost taken directly from Super Mario Bros, while the bird itself appears to be a cross between the Spike and Cheep Cheep enemies in Super Mario Bros. 3. The bird's mechanics also resemble the 2011 game, Piou Piou. Flappy Bird gained tremendous success, jumping to the top of the Apple and Android charts while setting social media into madness with boasts of high scores and reaction videos. According to Forbes, Flappy Bird brings in $50,000 in in-app advertising revenue each day. Nguyen said in a tweet, "I can call Flappy Bird is a success of mine. But it also ruins my simple life. So now I hate it." The Vietnamese developer said he will continue making games for the mobile market. You can breathe a sigh of relief for now, until another game takes its place. Let us know what your highest score is in the comment section below.